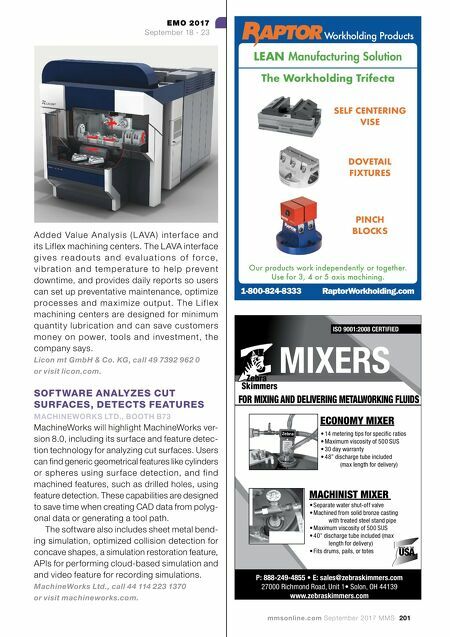 mmsonline.com September 2017 MMS 201 EMO 2017 September 18 - 23 Ad d e d Va l u e A n a l y s i s ( L AVA ) i nte r f a c e a n d its Liflex machining centers. The LAVA interface g i v e s r e a d o u t s a n d e v a l u a t i o n s o f f o r c e , v i b r a t i o n a n d te m p e r a t u r e to h e l p p r e v e n t downtime, and provides daily reports so users can set up preventative maintenance, optimize p ro c e s s e s a n d m a x i m ize o u tp u t. T h e L i f l ex machining centers are designed for minimum quantit y lubrication and can save customers mo n ey o n p owe r, to o ls a nd inve stm e nt, th e company says. 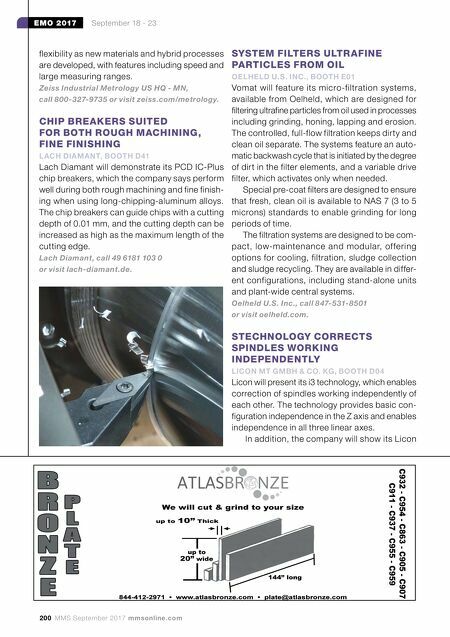 Licon mt GmbH & Co. KG, call 49 7392 962 0 or visit licon.com. SOFTWARE ANALYZES CUT SURFACES, DETECTS FEATURES MACHINEWORKS LTD., BOOTH B73 MachineWorks will highlight MachineWorks ver- sion 8.0, including its surface and feature detec- tion technology for analyzing cut surfaces. Users can find generic geometrical features like cylinders or spheres using sur face detection, and find machined features, such as drilled holes, using feature detection. These capabilities are designed to save time when creating CAD data from polyg- onal data or generating a tool path. The software also includes sheet metal bend- ing simulation, optimized collision detection for concave shapes, a simulation restoration feature, APIs for performing cloud-based simulation and and video feature for recording simulations. MachineWorks Ltd., call 44 114 223 1370 or visit machineworks.com. P: 888-249-4855 • E: sales@zebraskimmers.com 27000 Richmond Road, Unit 1• Solon, OH 44139 www.zebraskimmers.com MIXERS MADE IN THE • 14 metering tips for specific ratios • Maximum viscosity of 500 SUS • 30 day warranty • 48" discharge tube included (max length for delivery) ECONOMY MIXER ISO 9001:2008 CERTIFIED • Separate water shut-off valve • Machined from solid bronze casting with treated steel stand pipe • Maximum viscosity of 500 SUS • 40" discharge tube included (max length for delivery) • Fits drums, pails, or totes MACHINIST MIXER FOR MIXING AND DELIVERING METALWORKING FLUIDS Workholding Products LEAN Manufacturing Solution RaptorWorkholding.com 1-800-824-8333 DOVETAIL FIXTURES PINCH BLOCKS SELF CENTERING VISE The Workholding Trifecta Our products work independently or together. Use for 3, 4 or 5 axis machining.